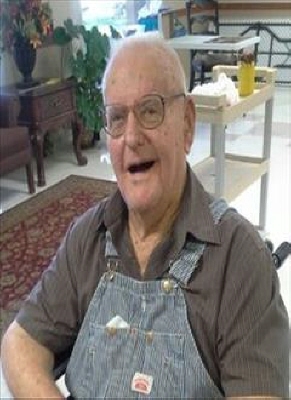 Charles Phillips, 96 year old lifelong Sharon area resident died Thursday January 31, 2019. Funeral services will be held at 11:00 am Saturday, February 9, 2019 in the Sharon First Baptist Church. Interment will follow in North Persimmon Cemetery with the Billings Funeral Home in charge of arrangements. Charles Lockwood Phillips was born on April 4, 1922, on a farm west of Mutual, Oklahoma. His parents, George Cliffton Phillips and Grace Clara (Canfield) Phillips welcomed him as their first born son. There on the farm, the small family grew with the addition of two younger siblings: Melvin and Albert. The three boys shared chores around the farm with their dad by working the land and animals. It was this time of growing up that Charles grew to love the land, to love animals, and to learn that hard work would give results. Charles started grade school at Mutual, and his younger siblings soon followed him. Charles (Chuck to some of his friends} played sports, studied somewhat, and continued to learn about farming from his parents. It was when he was in high school that WW11 began. Young men were eager to join the service to serve their country, so Charles enlisted in the Army, but ended up in the Airforce as pilots were needed. He was sent to learn how to fly and ended up being a B-22 pilot. Dad never talked much about being in the service to his children; however, he was proud to have served and displayed a wooden model airplane in the living room. It was while he was stationed in Texas that he met a young waitress named Tommie Jo Harrison. The two soon married as Charles was discharged from the service. The newlyweds moved back to Oklahoma with Sandra (Tommies daughter from her first marriage) and lived with Charles parents until he and his dad could build the rock home that still stands on Charles property and where his daughter Candy and family now live. Charles and Tommie soon welcomed a new addition to their family, a daughter named Marie Ann in January 31, 1947. Firmly established in their new home, Tommie was soon preparing for the arrival of a new child; unfortunately, Marie Ann developed an illness which took her young life in January of 1948. Still mourning the loss of their daughter, Tommie gave birth to another daughter, Donna Gail. Tragedy hung over the young family as Charles and Tommie soon divorced. The courts gave Charles full custody of his young daughter. His parents, Cliff and Grace, stepped up and took her in so that Charles could heal and work his new job, a traveling milk tester for the many dairy farms in and around the Northwest area of Oklahoma. It was during this time of being on his new job that Charles met Wilma Young, a young shy girl who lived with her aunt and uncle. They soon began dating, and Charles could see Wilma in his future. He brought her home to meet his parents and his daughter. All went well, because Charles and Wilma soon married. As the two started life on the farm, new babies began to come. Camellia (Candy) was born in June of 1955, Jerry came along in July of 1957, Delena Jean in November of 1958, and last to be born was Clara Charlene (Charlene) in March of 1960. These four plus their older sister Donna were soon to make life interesting for Charles and Wilma. Charles and Wilma decided that they should become dairy farmers full time. So Charles built a milk barn, bought milk cows, purchased equipment, and stocked the upper part of the milk barn with grain which would come down in chutes so that each cow could eat (and hopefully be still) when milked. It was an amazing adventure. The stories that each of Charles children could tell would make you laugh. As time passed each child knew their jobs: either helping Wilma in the house or helping Charles outside with the cattle and milking. However, life happens and so do tragedies. Wilma developed heath issues and spent time with doctors who tried to heal her. She passed away from complications and was laid to rest in the Sharon Cemetery on October 6, 1993. Charles soon connected with former friends, one of which was his high school sweetheart Eula Nelson. They soon realized there was still a spark and decided to marry which they did on January 15, 1994. The two first lived in a home that had been built for Charles younger daughter, Charlene, but as time passed Charles and Eula built a new life on property close to Albert and Helen. It was here they combined new families. New traditions were established and old ones continued. Charles and Eula continued to attend the Sharon Baptist Church where Charles had been a member since his marriage to Tommie Jo. He served as Sunday School leader, teacher, member of the church board, and spent his time helping to build new buildings at the Baptist Church summer camps. He was preceded in death by his parents and older brother, Melvin. Memorial contributions may be made to the Sharon First Baptist Church with the funeral home accepting the contributions. To send flowers or a remembrance gift to the family of Charles Lockwood Phillips, please visit our Tribute Store. "Email Address" would like to share the life celebration of Charles Lockwood Phillips. Click on the "link" to go to share a favorite memory or leave a condolence message for the family.